Most of the pictures of bigfoot, a giant ape-like creature supposed to live in the dense forests of the American northwest, are in reality a hoaxer's wife dressed in a gorilla suit, the man's relatives revealed Friday. 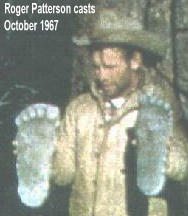 For decades until his death last month Ray Wallace awed America with pictures of footprints, recordings and photographs of the creature, but his family admitted it had all been an elaborate practical joke. To the horror of thousands of Bigfoot believers Dale Lee Wallace, the hoaxer's nephew, said: "He did it for the joke and then was afraid to tell anyone because they'd be so mad at him." 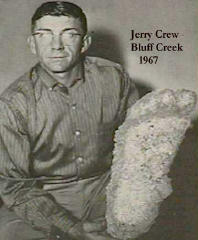 The first "evidence" for Bigfoot, a series of huge footprints, was found by Jerry Crew, a worker at Wallace's construction company in August, 1958. They were in fact created by his boss with wooden carved feet to "freak him out," but the local newspaper, the Humboldt Times in Eureka, Calif. ran a front-page story on the prints the next day and coined the term "Bigfoot." The tale was taken up by newspapers across the country and the public, fascinated at the time by tales of the Himalayan yeti, eagerly embraced the notion of a homegrown version. 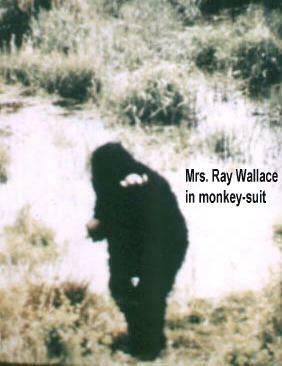 Wallace continued with the prank for years, producing photographs of Bigfoot eating elk and frogs. These, it emerged Friday, were in fact members of his family  usually his wife,  dressed in a hairy ape suit with giant feet stuck to the bottom. The most famous evidence for Bigfoot's existence, the so-called Pattersonfilm, a grainy, cinefilm image of an erect ape-like creature, was taken by Roger Patterson, a rodeo rider, in 1967. It was another of Wallace's fakes, the family said  he told Patterson where to go to spot the creature and knew who had been inside the suit. The family decided to finally reveal the truth after Wallace, 84, died from heart failure and a reporter for the Seattle Times approached them to ask about the rumors he had made it all up.